This casserole has layers of wonderful vegetables and fruit to make a delicious flavored dish. The last layer of the casserole will make you think it is a fantastic apple pie. 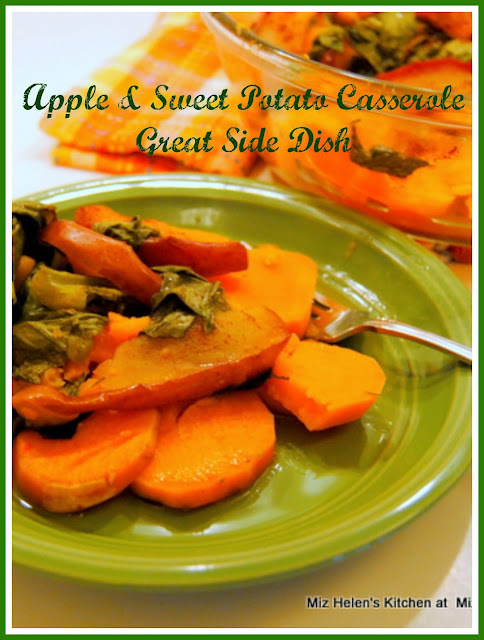 This is a real easy casserole to prepare and is ready in no time to go on the table. Our family loves this recipe and we serve it for family dinners and very special dinners. My friends that have had the casserole through the years will sometimes request this bowl of goodness. Butter a 4 to 5 quart baking dish. Peel and slice the sweet potatoes, place them in a mixing bowl. Toss the potatoes with 1 teaspoon salt, 1/2 teaspoon pepper and 1 teaspoon thyme. Layer the potatoes on the bottom of the baking dish. In the mixing bowl, toss the turnip greens with 1/2 cup apple juice, 1 teaspoon salt, 1/2 teaspoon pepper, and 1 teaspoon thyme. Layer the seasoned greens on top of the potatoes and pour the remainder of the apple juice from the mixing bowl on top of the greens. In the mixing bowl, toss the apples with the cinnamon and nutmeg. Layer the apples on top of the greens. Pour the remaining 1-1/2 cups apple juice on top of the casserole. Bake at 350 degrees for 45 minutes until the potatoes are tender on the bottom of the casserole. Remove from the oven and let stem in the baking dish for 10 minutes before serving. I sure am glad that you were able to stop by and spend some time in the kitchen with us today, it is always more fun to cook with a friend. Hope you have a great week and come back to see us real soon! Sounds delicious! Thanks for sharing at the What's for Dinner party!